I finally got a new desk and have been able to get my priorities straight and move all my makeup RIGHT NEXT TO ME! OMG! Those drawers on the right. That’s proper grown up pay the bills work stuff. The rest? MAKEUP and SKINCARE and NAIL POLISH and HAIR STUFF and all the other important things. I better do some work, I can feel a *side eye* from Mr. L. burning a hole in the back of my skull. That looks so neat. My makeup station is a disaster area. Dangerous, very dangerous lady. LOVE the desk though, it’s HUGE! I love your set up, you’re so tidy! I’ve got tons of make up stuff on my desk, as well as my drawers full of make up and polishes next to my desk! Is that a Mars bar I spy on your desk too? Shares!!!!! A chocolate bar… is it a Wispa, or a Mars? and is that OPI Mad as a Hatter on the left? I am obviously doing the wrong job. I wish I had a job that involved staying at home and working in my own sanctuary. I have a one of the small plastic stacked drawers. So useful. I will be buying some more very soon. Having makeup nearby is not a bad thing at all. Heeheee!! Great idea! When I was at high school my homework desk was also my dressing table, so I was forever stopping my revision *just to check* my makeup still works!! I dont know what Im more jealous of – all the makeup, or all the makeup storage solutions! Thanks for the opportunity you’ve offered! Oooh wow, so huge a stash! Where did you get the wooden storage things from? I love it, everything looks so neat and organized! Could you please come over and organise my study, pleeeeeaaaaaseeee!? Mmmm, you’re desk looks delicious! I love neat and stuffed desks, i dunno why haha. I got my giveaway (quite a while ago actually, but this is late :/) thanks, the card was sweet! @Jeweled Thumb – It’s only neat on the surface :/ Those drawers are hiding a multitude of makeup storage sins! @Sian – I know! I love having space! My old desk was teeny tiny! 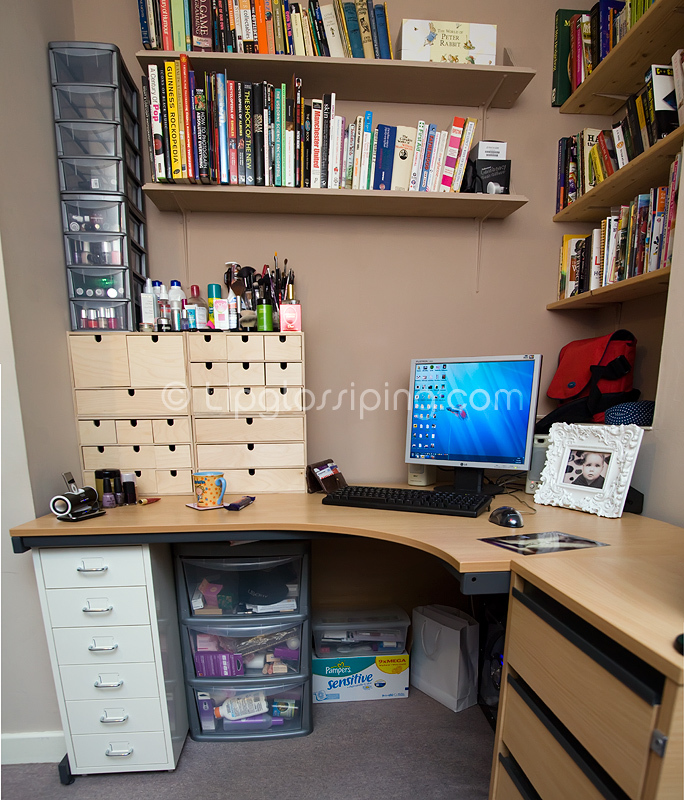 @SoVeryFabulous – I’m not *that* tidy. The big ol’ mess ontop of the drawers is a hint of what lies inside! It’s nice to reorganise though! @Jo – Wispa Wispa Wispa – no sharing allowed! @SoFrolushes – Those little drawers (my nail polish drawers) were on offer in Asda last week… I think they’re down to £4 at the moment. It is lovely to work from home, but quite often takes more discipline than I can muster! @Laura – When it’s all completely organised, it should be much easier for me to find everything (hopefully!). I did email you, but incase anyone else is interested… The drawers are Fira from Ikea, but they’re just been discontinued – boo! @Heather – Thank you! Desk space is a wonderful thing! @Nicola – oh no! but on the flipside, loads of stuff over there is ultra cute! @Redtiger21 – LOL@Checking to see if your makeup still works. Is that what we do? Not playing… checking. I’ll remember that! @OxfordJasmine – No! it’s boring! How the heck did you move a whole house huh?